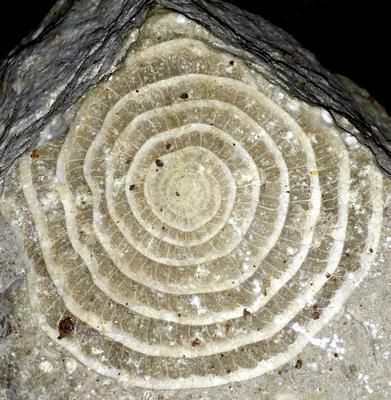 This is a coil-shaped fossil, about 3 - 4 cm in diameter; rock of unknown provenance (not found in situ), probably from a limestone quarry in central Slovenia that produced railway track ballast (the geo map tells that the limestone from this quarry is jurrasic). Other similarly shaped remains are on the rock. 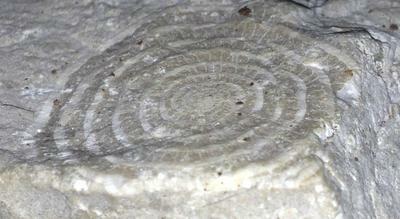 Comments for An ancient gastropod? I am almost certain that this is a section through a Nummulite - which was a type pf single-celled marine creature in the Class or Phylum "Foraminifera". It looks big (yes, a single cell!) and would therefore probably be from the Middle Eocene when they reached their largest proportions, making it about 45-50 million years old. 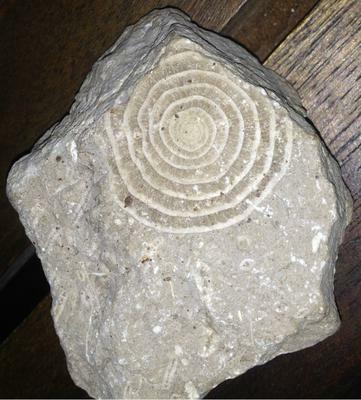 Is this fossil flat or is the center raised from the outside? It looks like a gastropod to me, but I can't tell you what species.